Haircuts: I love getting a hair cut! You’re hair feels so healthy & light afterwards… such a good feeling! Plus you hair ALWAYS looks better when someone else styles it! I’m tempted to cut my hair off… we’ll see! 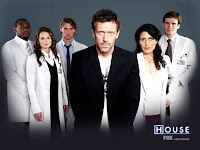 Addition: House, M.D.- The Kesler’s recently got us addicted to this show, and we are obsessed! We now have our DVR set to record every episode that comes on- re-runs and all! Yes, it’s that good. Check it out. Re-run marathon every Sunday night on USA- Be prepared to get addicted!